Rishi Turmeric Ginger Tea comes highly recommended. It carries the "Amazon's Choice" badge, and has a 4.7 star review, which is among the highest we have featured here. But what makes this tea so great? Only one way to find out. 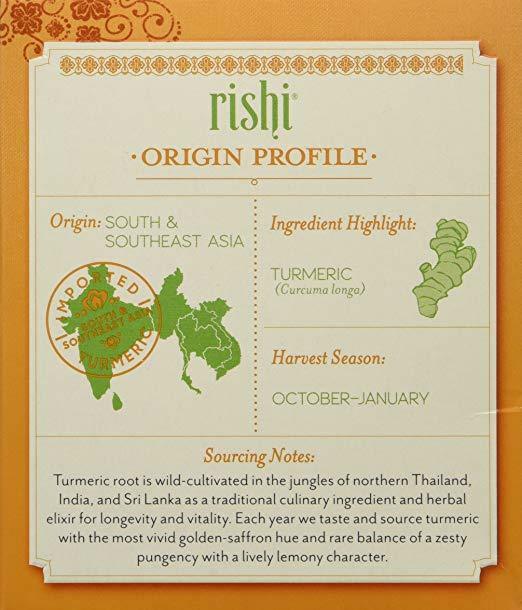 Rishi Turmeric Ginger Tea gives you a great tasting, exotic tea with origins from South and Southeast Asia. It combines two highly beneficial ingredients to make a tea with incredible quality. Not to mention that it is very much affordable, which is always a very good quality of any product. While the front of the tea box does look a bit generic, it is what is inside that makes all the difference. This is a prime example of why you should not trust a book by its cover. Rishi Turmeric Ginger Tea combines two extremely beneficial ingredients into one unique tea. Of course the two main ingredients are turmeric and ginger, but there is more that also helps to make up the tea. The complete list of ingredients includes Organic ginger root, organic turmeric root, organic licorice root, organic lemongrass, organic orange peel, essential orange & lemon oils. Not only are all of the ingredients 100% natural, the majority of them are also certified organic. Not that many teas we have featured here are actually organic, so it is always a great sign when we find one that is. In addition, root teas offer enhanced benefits because their ingredients are super concentrated. This tea can stimulate antioxidant activity in the body, prevent cancer, soothe inflammation, and promote good digestion. Plus, the ginger helps with nasuea, digestion, prevents chronic diseases, and increases the appetite. Herbal teas in general have a lot of great benefits to them. Regardless of the type of herbal tea you are drinking, there are somethings that you will be take advantage of. One benefit that you will get from all tea is weight loss. Now, this is not like the tea will burn off fat. Rather, the best herbal tea will remove water retention, so you will visibly look slimmer because you will lose a lot of your excess water weight. Another great thing about herbal tea is that you get a access to a wide variety of antioxidants, vitamins, minerals, and other nutrients. Because herbal tea often features a combination of herbs, you are able to take in a variety of great things that can be highly beneficial to your body. Other common health benefits of the best herbal tea include relaxing the body and mind, aiding in sleep disorders, reducing inflammation, easing various pains, protecting against common diseases like the cold or flu, boosting immune system, regulating the digestive system, and stimulating cognitive function. Rishi Turmeric Ginger Tea gives you not one, but two highly beneficial ingredients, ginger and turmeric, which both have various beneficial properties that your body can take advantage of. Rishi Turmeric Ginger Tea is probably one of the best teas we have featured on this list. Not only are the ingredients top notch, the price is also great to see. However, with this low price, you are also getting a lower quantity of tea. For under $10, you are getting just 15 tea bags, which is fairly low. However, the tea is great quality and certified organic, so you are getting quality over quantity. Now, there were several complaints from a handful of people. There were some that mentioned that the taste is not what they were expecting. The majority of the critical reviews said that the taste was very weak and did not taste the best. Now, these may just have been bad batches and not the general consensus, but it is still something to keep in mind when ordering. Rishi Tea and Botanicals was founded on three principles. Direct trade, organic certified, and culinary inspiration. All of their ingredients and products are sourced and imported from trusted growers that they have build a long and strong relationship with. All of their farmers are properly compensated for their work and they do not deal with middlemen. In addition, over 95% of their imported ingredients are certified organic, according to the USDA NOP standard. Rishi has even helped several producers convert from conventional to organic standards. Rishi also pays homage the roots of tea in their approach to research and innovation. Their goal is to make their tea as beneficial as it is traditional. If you are looking for top quality, 100% organic tea, Rishi Turmeric Ginger Tea has got you covered. Rishi is highly beneficial. It is mainly used to stimulate antioxidant activity in the body, prevent cancer, soothe inflammation, and promote good digestion. Plus, the ginger helps with nasuea, digestion, prevents chronic diseases, and increases the appetite. Rishi Turmeric Ginger Tea offers the best quality tea possible with 100% organic and fresh ingredients. This stuff will give you exactly what you want it to with its antioxidants and other various benefits. Typically the taste of ginger and turmeric is very noticeable and enjoyable. However, some have stated that whether it was a bad batch, or an issue with the seller on Amazon, the taste was rather weak and not as potent as it should have been. Overall, Rishi Turmeric Ginger Tea is a fantastic brand with a great quality tea. Hopefully those who had issues with the taste just had bad batches, and that seems like the case, seeing as the majority of people absolutely love this tea. If you want to try it out for yourself, you can grab a 15 count box on Amazon for $7.00, for a 2 pack for $11.84. For more information, including the best herbal tea buyers guide, check out the rest of Green and Growing. Here are some top questions that I found for people seriously considering buying the Rishi Turmeric Ginger Tea. Does this help sleep? This tea is not really for sleep. It is more for strengthening the immune system. Is this from China? No, it is a product of the USA.